Water is an essential part of our everyday living, and we are lucky to have water available right at our fingertips at home. However, when problems arise, there are several different ways that water can negatively affect your home. Whether a result of leaks or flooding, water damage can cause a lot of problems for a home owner. 1.Deal with the problem as soon as possible. Whether an emergency flood or a slow leak, quick action is essential to contain water damage. The most important thing to do at first is to stem the flow of water, if possible. 2.Call for expert help when you need it. 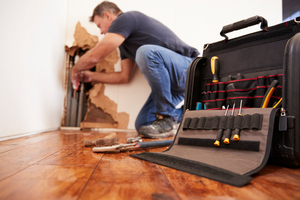 If you are not easily able to fix the problem yourself, you need to call in an expert to find a leak or fix a pipe. If this is the case, you should be sure to use an organization that is available 24 hours a day for emergency assistance! 3.Take steps to prevent future problems. Once you have started the clean up and fixed leaks or other issues, you should take a careful look at how to avoid a similar problem in the future. When you are dealing with water damage, it is important to fix the problem early and work with the right partner to help you clean up and repair damage. Our staff at AdvantaClean of West Knoxville is ready to help right when you need us! Contact us for assistance.